It has recently been demonstrated that surface acoustic waves (SAWs) can interact with superconducting qubits at the quantum level. SAW resonators in the GHz frequency range have also been found to have low loss at temperatures compatible with superconducting quantum circuits. These advances open up new possibilities to use the phonon degree of freedom to carry quantum information. 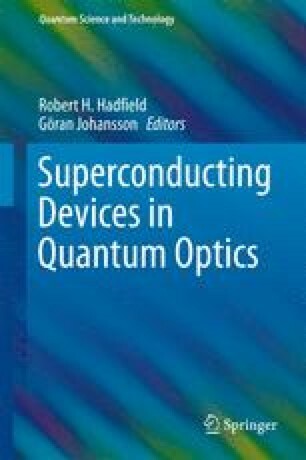 In this chapter, we give a description of the basic SAW components needed to develop quantum circuits, where propagating or localized SAW-phonons are used both to study basic physics and to manipulate quantum information. Using phonons instead of photons offers new possibilities which make these quantum acoustic circuits very interesting. We discuss general considerations for SAW experiments at the quantum level and describe experiments both with SAW resonators and with interaction between SAWs and a qubit. We also discuss several potential future developments. This work was supported by the Swedish Research Council, the European Research Council, the Knut and Alice Wallenberg Foundation, the UK Engineering and Physical Sciences Research Council. We also acknowledge support from the People Programme (Marie Curie Actions) and the FET-project SCALEQIT of the European Unions Seventh Framework Programme.